All summer long, in press conferences and at public hearings, Mayor Rahm Emanuel's budget refrain remained the same: no more accounting gimmicks and no new taxes. "We have been doing smoke and mirrors on the budget and avoided taking control of our own future as a city," he said at a public budget hearing in Englewood in August. "That moment of reckoning is here." 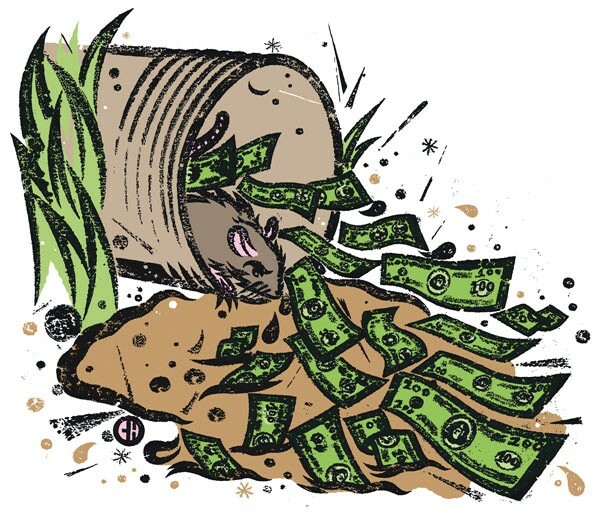 But the mayor who vowed to bring honesty to the budgeting process continues to rely on one of the oldest tricks of them all: the water/sewer fund sleight of hand. That's the one where the mayor says he's jacking up your water and sewer bill to pay for infrastructure and environmental protection—but then diverts millions of dollars a year to finance other city operations that have little direct connection to water, sewers, or protecting the lake. In this case, Emanuel is proposing to double water and sewer fees over the next decade, an eventual increase of about $500 a year for the average household. Yet how much of that money will actually make it to the water and sewer system is hard to determine, since, despite Emanuel's promises of transparency, his first budget obscures what's being diverted. A conservative estimate is that the mayor's 2012 budget will siphon off at least $70 million in water and sewer fees to cover other city spending, according to our analysis of budget documents and interviews with current and former city officials. That's roughly the same amount that Emanuel's predecessor, Mayor Richard Daley, appears to have moved out of the water and sewer funds in each of the last several years—though some former city officials say the total is probably far higher. "This budget is the biggest shell game I've seen yet," says Second Ward alderman Robert Fioretti. There's no question that hundreds of miles of leaky water and sewer lines are in desperate need of repair, and, as the mayor notes, fixing them could put thousands of people to work. "This is a real issue—the infrastructure is crumbling," says Fioretti, who's dealt with more than 700 sewer cave-ins in his ward this year alone. What's more, Emanuel's budget is balanced with a number of cost-cutting moves in addition to the water rate hike, including layoffs, police station closures, and reduced library hours. And Emanuel isn't the first mayor to funnel water and sewer funds to other city operations. Daley was a master of the game. That's why an official who worked for Daley for years describes the water and sewer money this way: "It's a big slush fund." In claiming a balanced budget, what is Rahm smoking? The mayor's recent claims on taxes and marijuana just don't add up. What kind of independent alderman works with Mayor Emanuel? Ameya Pawar explains how he tries to function in Rahm's Chicago. Rahm will mess with anyone who dares to oppose his policies against the poor. Mayor Emanuel sticks it to the poor to collect a few million bucks a year. History reveals that Emanuel won't change much about how the city taps its water supply. Thanks to an old budget trick, Chicago has even fewer police on the streets than it appears. A Million Here, a Million There . . . The City Council's cut of the 2006 budget.